Warren Beatty was born on March 30, 1937 at 17:30 (05:30 PM) in Richmond, Virginia (37 N 33 /77 W 28) (source: AstroDatabank, Rodden Rating AA). Not to overwhelm you with information, we will only assess the horoscope of Warren Beatty by looking at the factors that only have some meaning for his love life. The ruler of the Ascendant at a critical degree fully marks the person because the ruler of the 1st house represents the primal urges and the most instinctive drives. At 15° Aries, the ruler of the Ascendant is about passion, to be in 'fire and flame' easily, following the principle 'easy come easy go', living strong physical desires and urges... (especially when young). Later in life, this critical degree may indicate more stress in relationships though. Mercury, representing youth, in the 7th house in Aries often points to younger lovers as well. Hence, it does not come as a surprise there is a 21-22 year age difference with his wife! Saturn conjunct the Descendant is highly important because Saturn conjunctions work out like a hook and super-glue. Saturn conjunct a house cusp really is that important because it just hooks to the significations of that house. The 7th house represents encounters, relationships, meetings and the 'significant other' as well. Additionally, Saturn trines Pluto which adds emotional attachment and stamina. The Saturn-Pluto trine adds lasting power and reflects highly stable situations in matters of relationships. No wonder, this configuration denotes a long lasting bond. The Venus-Uranus conjunction in Taurus in the 8th house reflects short-lived encounters, love at first sight and sexual experiments. The sexual part is especially indicated by the involvement of Mars (inconjunct Venus) in fiery and outgoing Sagittarius. In a male horoscope, retrograde Venus delays love and marriages. No wonder Warren Beatty married for the first time when he was 56 already! Moon/Jupiter because Jupiter is posited in the 4th house (mundane ruled by the Moon), the Moon is sextile and parallel Jupiter. No doubt, Moon/Jupiter connections bring popularity and (some) renown. The downside is vanity though and an extreme urge for attention and to be in the spotlight. Warren Beatty may expect the best and the biggest things to happen. Mercury/Neptune because Neptune is in Virgo (ruled by Mercury), Mercury is parallel and inconjunct Neptune and the ruler of the 6th house (mundane ruled by Mercury) is in the 12th house (mundane ruled by Neptune). This is a very intuitive connection, not a rational one. He 'feels' the other and adapts accordingly. Moon/Pluto because Pluto is in Cancer (ruled by the Moon), the Moon is in Scorpio (ruled by Pluto) and the Moon trines Pluto. Traumatic childhood experiences are pushed away. Stress may result in stereotypical behavior (always doing or saying the same things). This can be a very competitive connection also. The Grand Trine in water signs between the Moon, Saturn and Pluto indicates a very intuitive, caring and sensitive nature who feels the atmosphere instantly and reacts accordingly. Warren Beatty is a very private person with a soft side. Also, a Grand Trine is told to denote too self-sufficient, self-fulfilled, dignified and vain (self-conscious) characteristics as well. Reportedly, Warren Beatty married Annette Bening on March 3, 1992 in Los Angeles, CA/USA. The marriage was only made public around March 12, 1992 because both partners wanted a very private ceremony. They met in November 1990 in San Pietro, Beverly Hills and it was love at first sight. Warren is Annette Bening's second spouse (she married for the 1st time on May 26, 1984). Warren Beatty and Annette Bening have 4 children: Kathlyn Elizabeth, since the age of 14 Stephen (born January 8, 1992), Benjamin (born August 23, 1994), Isabel (born January 11, 1997) and Ella (born April 8, 2000). 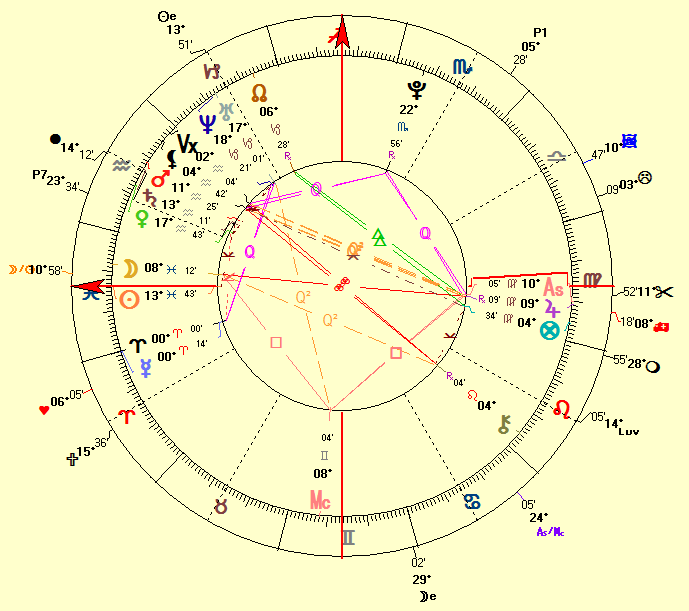 The chart of his Wedding below is calculated with the Sun at the Ascendant since the time of the wedding is unknown. 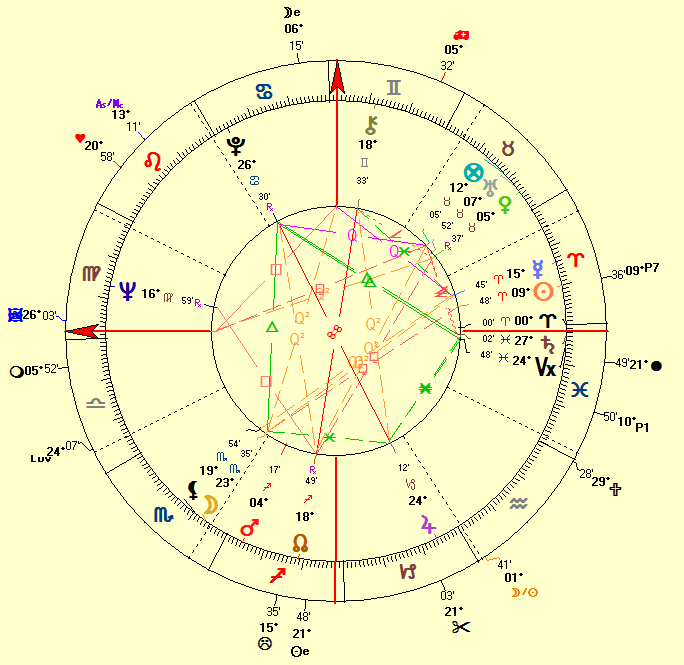 In this marriage horoscope Mercury at 0° Aries (the Vernal point) suggests public news, news in general.